31831 JAMES MCCABE, NO 3506. 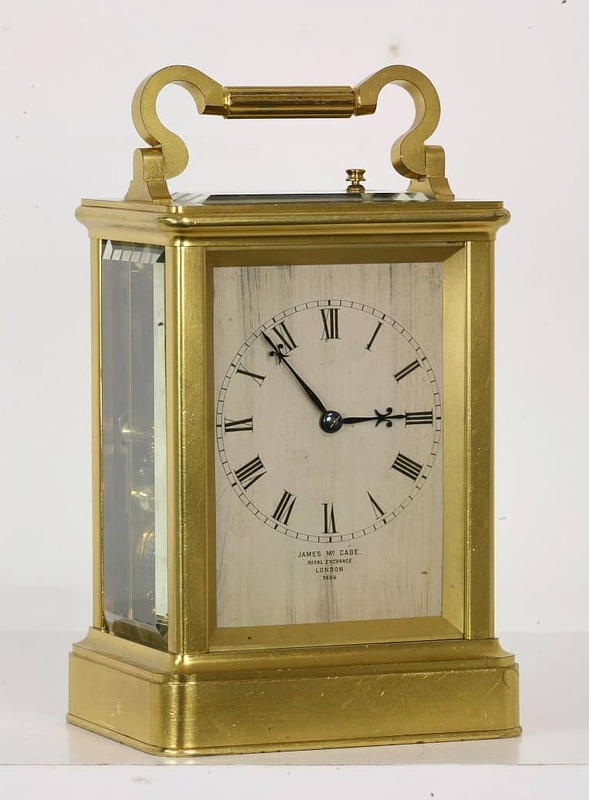 A FINE BRASS REPEATING CARRIAGE CLOCK. CIRCA 1855. 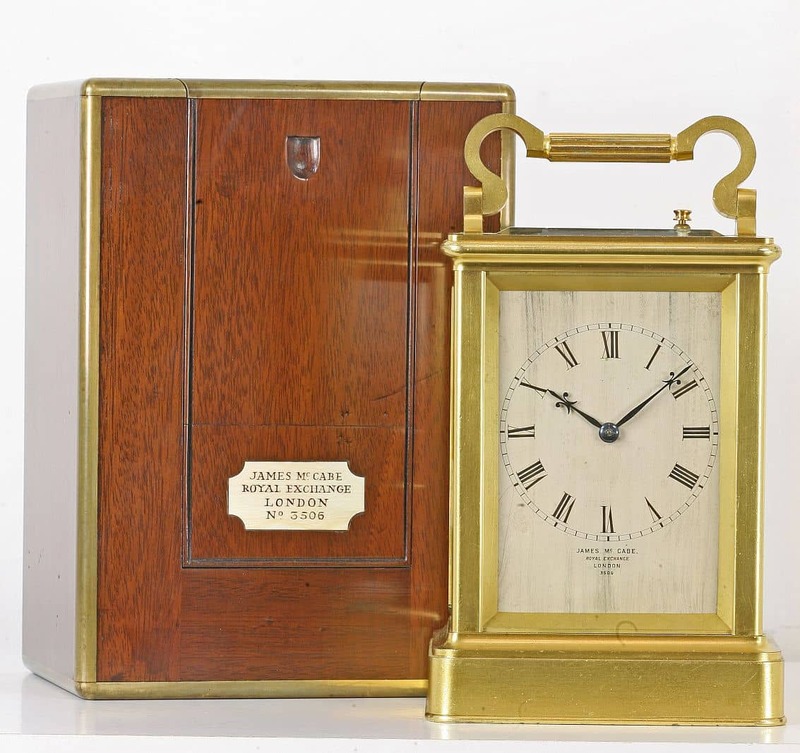 An extremely attractive gilded brass cased carriage clock by this famous maker. 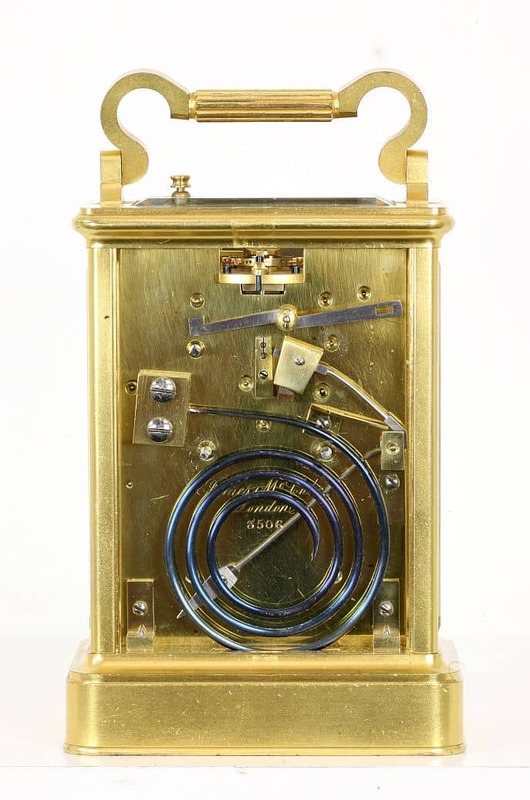 The case, with a curled and reeded carrying handle, has bevelled glass panels to the top, the dial and the two sides and a shuttered gilded brass rear door with closing apertures for hand setting and winding, adjustment for regulation and a strike/silent lever. 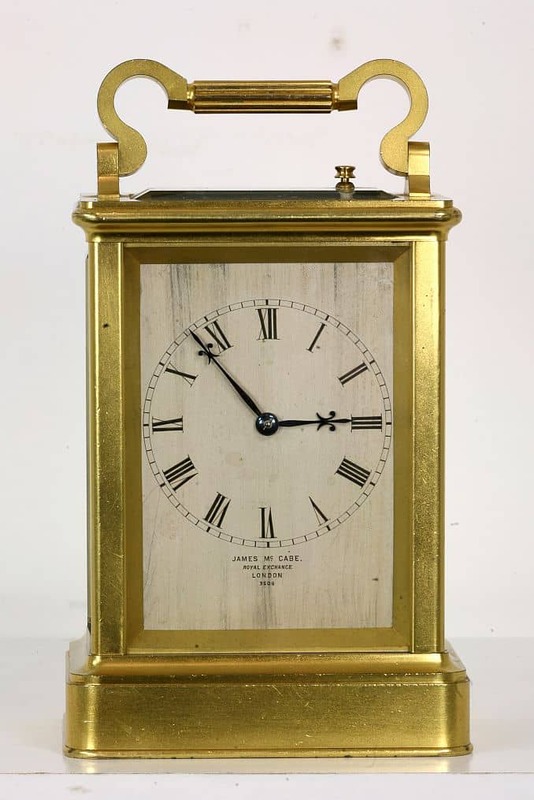 The dial of the clock is silvered brass with Roman numerals and is signed for the maker ‘James McCabe, London, No. 3506’. It has blued steel trefoil hands. 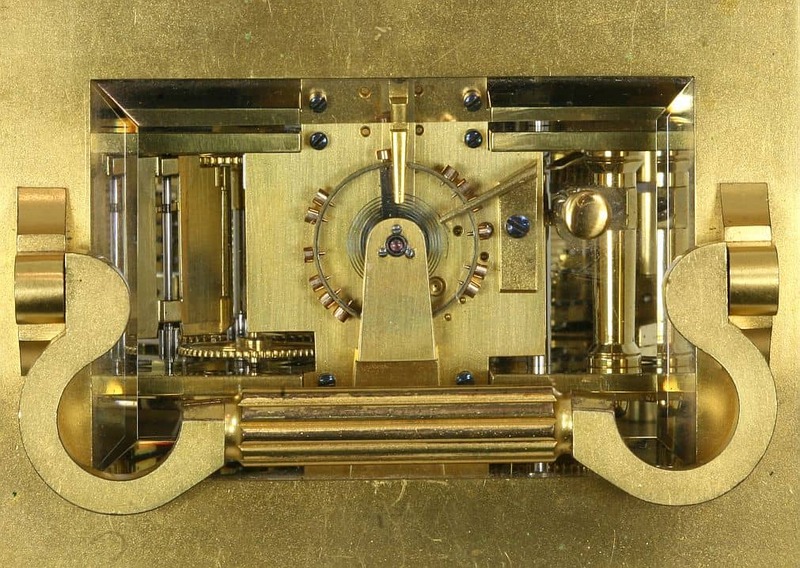 The eight day chain fuse movement strikes the hours on a gong mounted on the backplate. The backplate is similarly signed and numbered for the maker. It has a repeat lever coming through the top viewing glass in a position which means that when the handle is folded flat it does not press the repeat button. 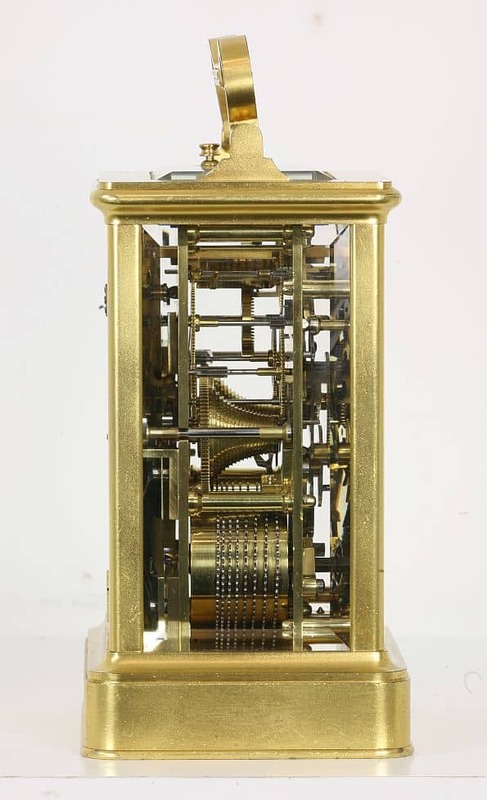 The clock has a cruciform shaped frosted, gilded platform to the top with unusually a bimetallic compensated balance wheel with poising screws to the lever escapement. 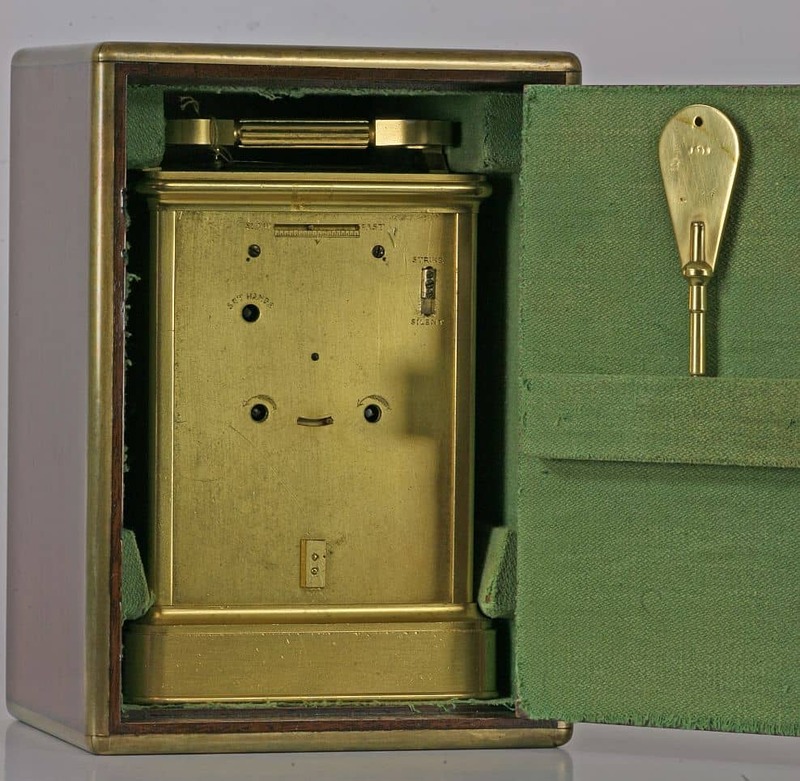 This series of clocks by McCabe are beautifully made. They have superbly smooth winding. The movements are exemplary. The shutters on the doors always open and close smoothly and all in all they are a joy to wind and live with. 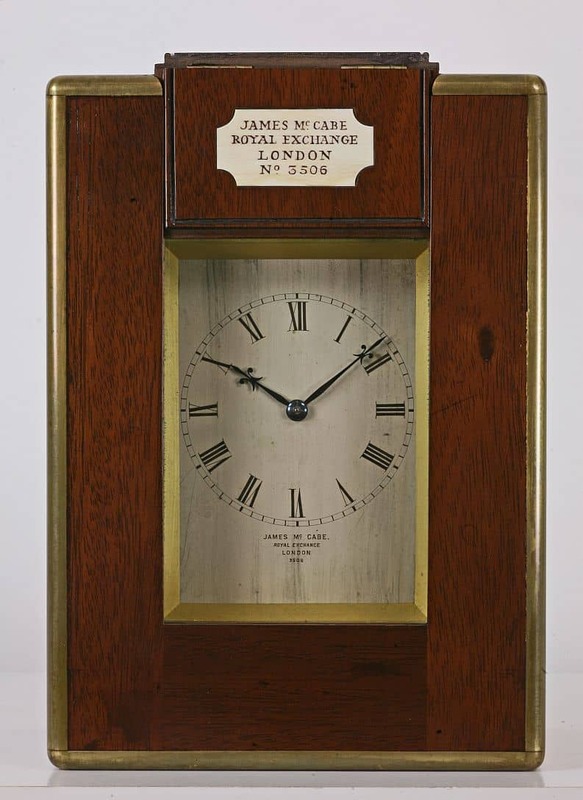 James McCabe was born into a watch and clockmaking family in Belfast. He came to London in the 1770s, settling at Royal Exchange in 1804. He gained his Freedom of the Clockmakers’ Company in 1781 and became a Warden in 1811, the year he died.